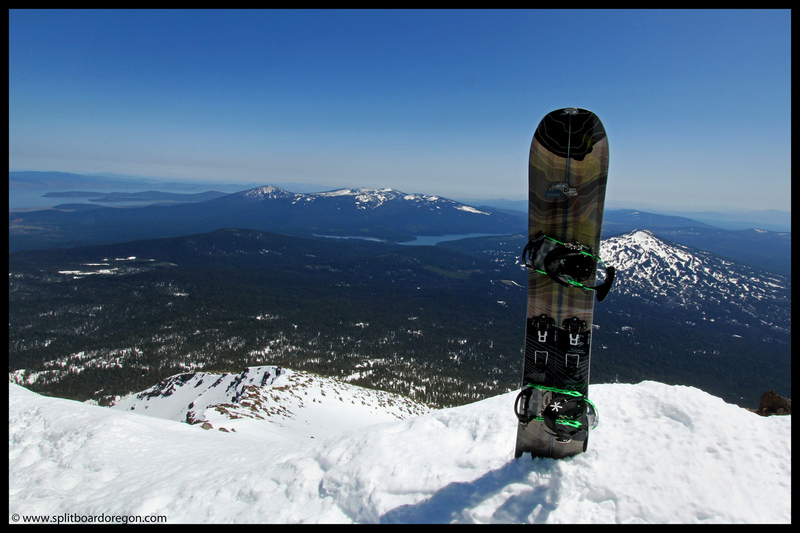 The Solution from Jones Snowboards is a split which performs admirably in all types of terrain and conditions. I’ve been riding the Solution for three seasons now, and I’ve really appreciated it’s reliability and predictability in all snow types from powder to ice. Although I recently upgraded to custom Chimera Mace for riding on the volcanoes, the Solution still holds a place in my quiver and gets used several times each winter. General Impressions: The Solution is marketed as an “all conditions” board, but one of the first things I noticed was how well it performs in powder. The blunt nose and directional rocker definitely make a difference and slashing through the deep stuff on this board is a cinch. The overall weight of the board is right in there with similar boards from other companies, and the 161 cm length handles my 175 lb frame plus pack and gear without issue. With the same specifications as the Flagship (the solid version of the Solution that I use for ski patrolling), it’s no wonder the board feels so nice under my feet. On the Skin Track: The Solution is a solid split. It tours exceptionally well with the Karakoram SL bindings, and I’ve used it with Spark Burner’s with similar results. The combination camber/rocker profile of the base provides more than adequate purchase while skinning, and the width of the skis aren’t too wide, which means you don’t have to break trail even when you’re following a skier. In Ride Mode: I’ve been very pleased with how the Solution rides. As indicated above, powder performance is great, and the board definitely excels in corn, crud and other conditions. The 9.1 m sidecut (on the 161 cm) allows for quick turn initiation in firm snow, and the camber underfoot coupled with the directional rocker at the tip and tail make the board nice to ride in less than optimal conditions. Mellow magenetraction along the edges add a bit of stability in icy conditions (at least theoretically), and the blunt design of the board’s nose keeps you floating through the pow. One extra nicety with respect to riding is that the board comes equipped with split clips from Karakoram, which really keep the board halves clamped together. Bottom Line: After some initial quality control concerns during the first year or two of production, Jones has righted the ship and is producing one of the finest all conditions splits on the market. If you want a board that can handle everything, check out the Solution! Jones created a winner in the Hovercraft Split. Marketed as a quiver board for powder and soft snow, it definitely excels in those conditions. Surprisingly, it also performs remarkably well in many other soft snow conditions, including crust, crud and chop. This is my second season on the Hovercraft Split, and it’s the board I grab on a powder day. General Impressions: The over sized blunt nose and 26 mm waist width on the 156 cm split provides more than enough float for my 175 lb frame plus pack and gear on even the deepest of days. I must admit, at first I was a bit skeptical about riding a board several centimeters shorter than my normal powder board, but after the first run on the Hovercraft, I was sold. On the Skin Track: The Hovercraft performs solidly while touring. I’ve used it with both the Karakoram Split 30’s and Spark Burner’s, with no real noticeable difference between the two. The board provides plenty of grip while skinning due to both the camber underfoot and the wide width of the ski’s. One minor thing to note when following skiers – it’s easy to feel like you’re re-breaking trail since their skis are narrow in comparison to the board halves of the Hovercraft. In Ride Mode: This board is fun to ride in soft snow, period! Part of the reason the board floats so well, besides the blunt nose and wide waist, is due to directional rocker at the tip and tail of the board – you literally feel like you’re hovering over the top of the snow! Camber underfoot provides stability when the snow firms up, in combination with the mellow magnetraction. To be honest though, I’m not sure the mellow magnetraction adds anything substantial to the ride. The shorter length of the board makes it a pleasure to ride in treed terrain, providing quick and nimble turns. 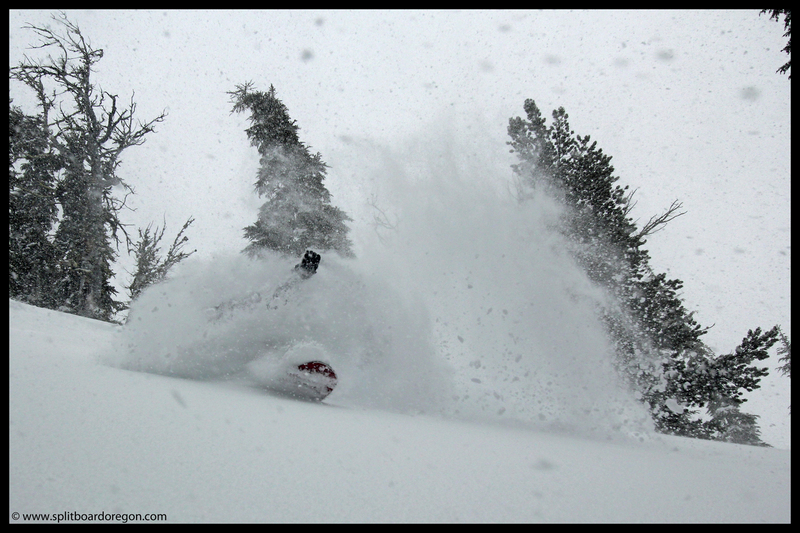 Bottom Line: If you’re looking for a powder specific split to add to your quiver, look no further than the Hovercraft!